Residents of Oklahoma can apply for license plates with the Motor Vehicle Division. There are a variety of different place aside from the standard style, such as, specialty license plates and disability license plates. Standard issued license plates: has a blue background with black lettering. Specialty license plates: contains a decorative style from organizations, occupations, special causes and more. Disability license plates: for individuals with a disability. Most of these license plates came be personalized to have a unique plate number. There are certain guidelines to be followed by the MVD in order to personalize a license plate. There are also temporary license plates which must be obtained when you purchase a new vehicle. Temporary license plates allow you to drive legally on state roads while your vehicle’s registration is being processed. Specialty license plates can be applied for when registering your vehicle. There are additional fees that vary by plate. Some plates, such as Military License Plates, require eligibility and additional documentation in order for them to be issued to you. Contact your local MVD office in Oklahoma to obtain a completed list of speciality plates and the fees you are expected to pay. Oklahoma license plates can be personalized with a unique plate number. You should look up available plate numbers online before submitting an application. It it possible to submit an application for specialty plates online, in person, or by mail. Before your Oklahoma license plates expire, you are required to renew your vehicle’s registration with the MVD. After you have paid your renewal fees and your application has been processed, you will receive new decals which can be placed directly over top of the old ones. Be sure to renew your vehicle before it expires to avoid any unwanted late fees. You can surrender your license plate by dropping them off or mailing them to an MVD office. Note: If you have sold your vehicle, you have 30 days to transfer your license plates to a new vehicle. 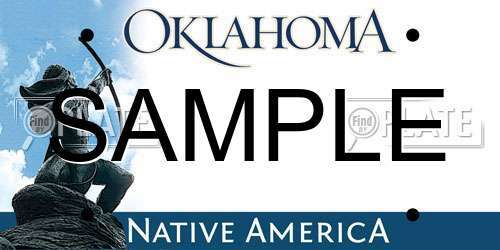 If you have lost, damaged, or stolen license plates, you can apply for replacements with the Oklahoma MVD. You may be able to retain your old license plates and any damaged license plates should be surrendered to the MVD office. You may receive a renewal reminder in the mail and you are expected to submit any necessary documents and payments for fees prior to your vehicle’s expiration date. Failure to renew your vehicle will result in late fees. For a full list of fees when registration your vehicle, contact your local MVD office. The search bar above allows you to look up available license plate numbers in Oklahoma. You can also use it to obtain a vehicle’s background information, such as whether or not the vehicle has been reported stolen, damage reports, and more.